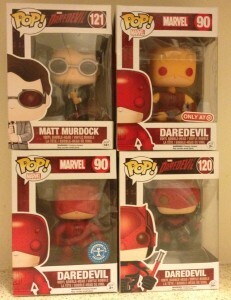 It’s been a while since I added items to my Daredevil collection. It was long overdue, wasn’t it? 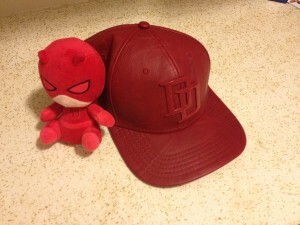 I picked the baseball cap up at Fan Expo last month and the plushie at a store in the mall. 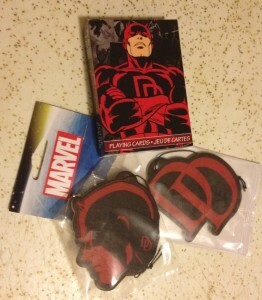 I couldn’t believe that there is such as thing as Daredevil air-fresheners. I don’t even use air-fresheners in my car. I hate to have things hanging from my rear-view mirror. But I bought this pack just because. 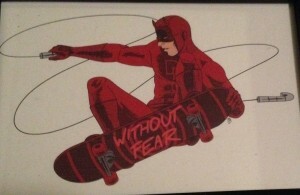 Daredevil is my favourite super-hero and I love skateboarding. What an awesome piece! These two pieces were given to me as birthday gifts for the past two years. I love them so much! I started collecting Pop figures. I have Matt Murdock and Daredevil in his Yellow, Red, and Netflix costumes. There is one other figure that I need to add to this collection, a Man Without Fear black-costumed-figure. I hope to get it soon. 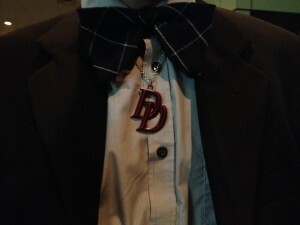 I don’t wear jewelry but this Daredevil necklace is gorgeous. It is metal and an official Marvel product. 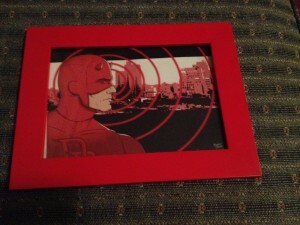 I can’t quite add this to my collection, but I did see a really cool Daredevil panel at Fan Expo this year featuring Joe Quesada, Charlie Cox, and Elden Henson. And I took this photo. 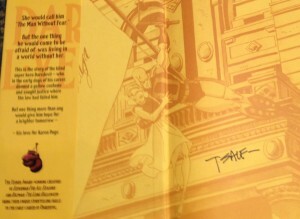 It was a pleasure meeting and talking to Tim Sale about origin stories and the work he has done in comics. 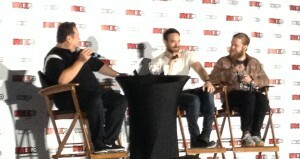 Fan Expo was a lot of fun this year. Those are my latest adds to an ever-growing Daredevil collection!